This handcrafted sink is made with a luxurious hammered nickel finish. The bold and innovative design offers more than just a sink, it is a work of art for your home. Featuring a maintenance free finish and straightforward installation, a hammered nickel sink from Sinkology is intended for everyday living and offers a limited lifetime warranty. Gravena offers a modern, linear style with square / rectangular bowls. The tight radius corners of the bowls make it easy to clean around the linear edges of Gravena sinks. The rear drain placement ensures dishes don't settle on the drain and prevent water flow while the drain grooves in the basin channel water towards the drain, keeping your sink clean and dry. Homer Drop In Handcrafted 15 in. 1-Hole Bar Prep Sink in Hammered Nickel This handcrafted sink is made with a luxurious hammered nickel finish. The bold and innovative design offers more than just a sink, it is a work of art for your home. Featuring a maintenance free finish and straightforward installation, a hammered nickel sink from Sinkology is intended for everyday living and offers a limited lifetime warranty. Homer Drop In Handcrafted 15 in. 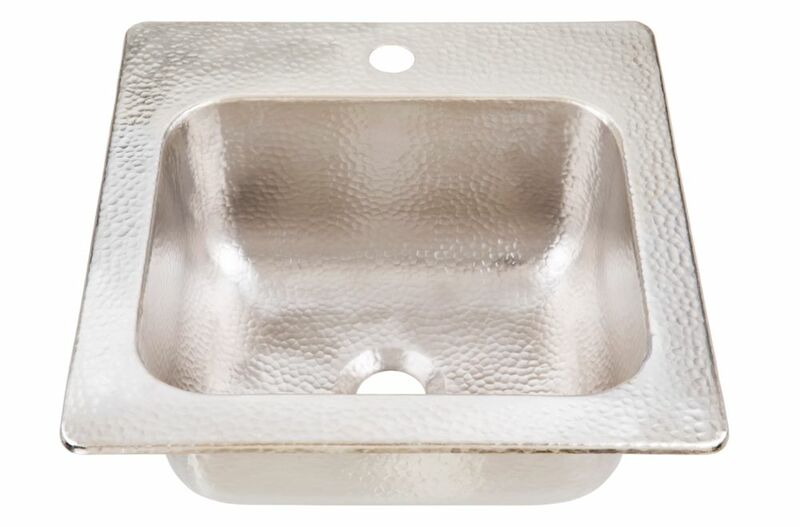 1-Hole Bar Prep Sink in Hammered Nickel is rated 4.3 out of 5 by 3. Rated 3 out of 5 by Sherry from Good look and a good alternative from the regular stainless... Good look and a good alternative from the regular stainless steel sink. But the surface is uneven, so it does not lay flat on granite countertop. You have to keep bending it. There is no solution for installation at all. We have to glue it down with a lot of weight on it. Not a smart design! Rated 5 out of 5 by KT from Looks great in our bar. Looks great in our bar. Rated 5 out of 5 by easyrider from Sink arrived well packed, and fit precisely, with a very nice appearance. Have received many comp... Sink arrived well packed, and fit precisely, with a very nice appearance. Have received many compliments! !